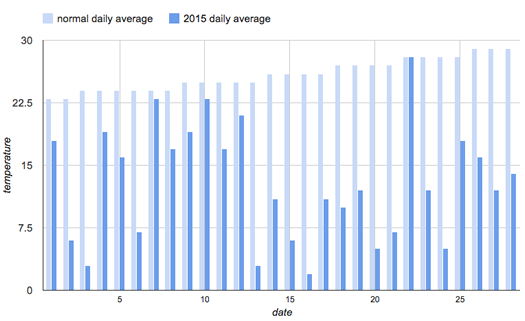 Average daily temperatures for this February 2015 versus the typical daily temps for each day. For the (almost) record: the past month was unusually cold. This February was the second coldest February on record, according to the National Weather Service. The average daily temperature was 12.7 degrees -- 13.2 degrees colder than a typical February. (The record for February is 12.1 degrees, set in 1934.) That mark also tied for 4th coldest month on record for Albany. There were 12 days during February on which the minimum temperature dipped below 0. Temperature record date back 1820, snowfall records to 1885. In related news: It's now March.